Aw Sanbaz well thats the beauty of goy - you can see them without having to suffer but most really are lovely. Thanks Pg on one occasion it turned over to dry out and has an orange case with black edges.Not quick enough for that ! Thanks Jacque hope you enjoyed your week end . Great shot Bonkers, I wonder if we have one similar over here. I'll have to do some research on it. Lovely photo, I saw one a couple of weeks ago, but it didn't land on anything! Thanks Amy yes very lucky as trying to get some bug shots in the pond when Jane said behind you ..
Oh Flower you have some beautiful butterflies remember the Swallowtails used to get them here not seen one since childhood. Hopefully Sunblest this will be a good year for them a nice warm summer would do them and us the power of good. Yes quite small Dawn the Brimstones are lovely and like you we have a dedicated nettle patch think I must have composted them accidentally as 6 foot plus and still growing ! Wonderful shot BB........sawone the other day but he had no time for me! Lovely photo. The transformation in the pupa from caterpillar to butterfly never ceases to amaze me. Thought of you saturday Jacque as working in a garden below Olivers Mount where they had the Barry Sheene Memorial race - the track is steep and in dense woods so only catch the briefest glimpse. When races over able to drive round course so may do a blog for the biker fans ..
Dont give up hope Hollyeves and Janey after the poor summers we ve had recently - the forecast is good for this summer and think we ll see a big increase in butterflies this year. Aye Linda from those little bugs into these beauties is remarkable. Beautiful little butterfly Bonkers. I heard on the news that we should expect to see a lot of Painted Ladies this year. I do hope so,and I don't care what type they are either. Yes Toto Philc has 5 in his garden dont see them so much up here perhaps prefer heathland bracken etc I think we will see many more as summer promises to be a good one . 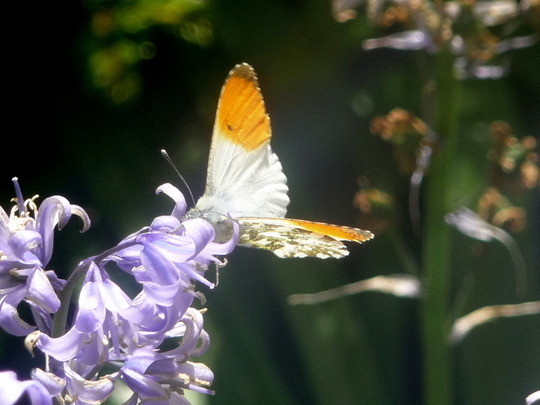 Lovely to see butterflies around again. Lovely and effective up against the lilac colour . Take heed every one there is hundreds and thousands of painted lady butterflies hitting uk at the moment which has not been seen for a while from Africa and has been reported being sighted south by other gardeners they say they are heading northwards. In Observer too also claim its showing we are going to a have good summer. Thanks for info Morgana - thats great news my nettles brambles ivy etc waiting for them and lets hope buddlea flowers this year after some pretty drastic pruning . Beautifully captured, a photo to treasure. I have seen a number of these in my Cornish garden. So delicate and really eyecatching. Meadow browns and a painted lady have also put in an appearance this week. If you have scented or heavy pollen flowers in bloom, now is the time to look out for Britain's largest moth in the evening. The Ghost Moth. Don't worry, you'll recognise it! Wow, I guess we don't have these in Eastern Washington. She/He is a beauty. BB not seen one yet......lots of painted ladies though, still not quick enough with the camera, will have to do better, the story of my life!!!!!! No Painted ladies here yet and guess you have your own beauties in Washington , Weeds. Aw Dd you ll have to sit and wait for them to come to you I was trying to photo something else when it landed behind me. That's lovely......do you mind if I use this one to do a painting please Ray/Jane? What a great shot bonkers! Not at all Sid if you could pm me your email again - no havent lost it just save me trawling through - happily send you a copy. No painted ladies but lots of swallows arriving to nest . Thanks Pollyanna lovely to hear from you seems like so long since Bruce up on the roof shovelling snow ! Hope you are both well. I've missed everyone, been busy adjusting to new life here and emerging from the horrible winter! Is it summer yet? Have bought a new home not so far out. Going from 2 acres to small lot lovely front area but lots of cement the rest! Lots of challenges ahead but exciting possiblities! Be posting again soon! Great shot Bb, wonderful colour. I remember we were in Durban, South Africa one year at Christmas, and on cue on Christmas day just as we were having dinner it snowed! ..... Or it seemed to but the flakes were going up not down and it was around 30 C in the shade, when we looked properly it was literally millions of cabbage whites taking to the air, apparently it happens a lot in Durban. Lovely tale Bobg , could never quite get my head around Christmas being hot and having a barbie on the beach ..
Lovely butterfly. Unusual color from any I've seen. Thought it was really beautiful...notice you have been commenting on a few butterflies...hope they cheered you up a little these dull dark days ! They certainly have done that, BB.